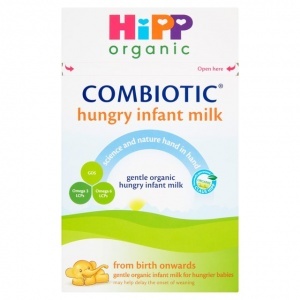 Hipp Organic Hungry Infant Milk is a nutritionally complete, casein based, gentle infant milk that is suitable for use after first infant milk if baby is not being breastfed, or to complement breastfeeding. Using this product may help delay the early onset of weaning, as the higher proportion of casein means that it may satisfy extra hungry babies for longer than a whey-dominant formula. This gentle organic formula contains Omega 3 & 6 LCPs (DHA & AA) and PRãeBIOTIK® oligosaccharides (GOS), as well as all the important vitamins, minerals and other nutrients (required by law) that babies need to grow strong and healthy. Please follow preparation and feeding instructions carefully; failure to do so may make your baby ill, as powdered milks are not sterile. 1 Wash hands and sterilise all equipment according to the manufacturers' instructions. 2 Boil 1 litre of freshly run water and leave to cool for no longer than 30 minutes. Do not use artificially softened or repeatedly boiled water. 3 Measure the required amount of water into a sterilised bottle (referring to the Feeding Guide). 4 Using the scoop provided add the correct number of scoops of powder - 1 level scoop of powder to each fluid ounce of water (approx 30ml). Level off the powder using the scoop leveller. Do not press the powder. 5 Place the sterilised teat and cap on the bottle and shake well until all the powder has dissolved (approx 15 seconds). 6 Cool to drinking temperature (approx 37øC) by holding the bottle under cold running water. Always test the temperature of the milk before feeding. This table is a guide only; your baby should be fed on demand, particularly in the first few weeks, and may need more or less than the volumes stated. If you need more advice, please contact your healthcare professional.